Just My Opinion has reviewed the following Pregnancy products for your convenience. The items listed here are for the use of mom's during their nine months, delivery and recovery. Please feel free to peruse these items and if you have also tried these products, please add comments with your opinions! 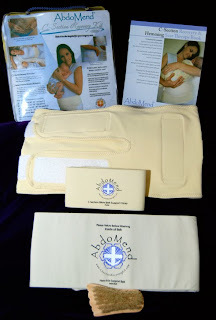 Abdomend has created an amazing C-section recovery kit that every woman having this surgery should not be without. We've given it a HIGH five-star rating. After your surgery, you put on a compression belt which covers your incision area and pulls everything in tight. This reduces the pain from the incision as well as adding extra support to your healing abdominal muscles. This is especially helpful when you try to get out of bed those first times which can be extremely painful. The bikini belt should be used for the first month post-C-section. I didn't use the belt in the hospital, but started using it after I had returned home. I wish I had started using it right from the beginning. The added support truly does reduce the pain and gives you strength which you wouldn't have due to the surgery. A physical therapist of ours recommended using it during all waking hours but then taking it off at night to allow your core muscles some time to develop again. Following these instructions, I've found incredible help from the belt when doing everyday things, even just feeding or picking up my newborn. I can't say enough about this belt. This is my second C-section and I didn't have anything like it last time. I had a very hard recovery and it took me quite some time before I had built up any strength. With the belt on this time, within just a couple of days, I was feeling great and had plenty of strength. It's hard not to find false faith in your recovery as the belt makes you feel THAT good when wearing it. The price ranges from $99.90 - $103.90 depending on your size. The customer service is phenomenal and is very supportive. The Deluxe kit, which I had, also comes with a Hem-It-In Belt to be used for core support in the 2nd and 3rd months following surgery. There are massage techniques and tools to help you work on smoothing out your new or existing scars. Overall, this product is phenomenal and something I would recommend for any woman going in for a C-section or any type of abdominal surgery! Click on the image for purchase options.